Anthony (Tony) Burch has spent the last 30 years working at local pizza and burger restaurants. He and wife, Beverly, dreamed of having their own restaurant. When the local Subway franchise in east Gainesville on Hawthorne Road closed, they jumped on the opportunity to lease the space. However, they didn’t know what was involved and the paperwork needed for proper licensing and permitting to get open. In May 2018, acting on their banker’s recommendation, Tony and Beverly reached out to Mike Chung, a consultant with the Florida SBDC at the University of North Florida (UNF) in Gainesville. “In our first meeting, it was clear that the Burchs had the drive, determination, desire and commitment to launch their business. They just needed guidance and a dose of reality. They were shocked when I told them they would not be open in July like they were planning,” said Chung. They also had no business plan. Chung worked with them to determine break-even, do a two-year cash-flow projection, estimate startup costs and financing needed, understand licensing and permitting requirements, and develop their menu and pricing. Using a pre-opening and opening checklist, they were able to stay on top of tasks, schedules and deadlines, especially with the buildout. With help from the Florida SBDC, Beverly and Tony have been able to open a pizzeria in Tony’s childhood neighborhood, while creating six jobs. 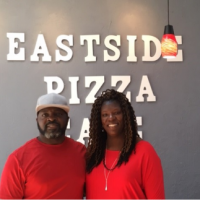 Four months after first contacting the Florida SBDC at UNF, Eastside Pizza Cafe’s owners Tony and Beverly are proudly catering to the area that shaped Tony, serving one slice of pie at a time. Despite working a full-time job, Beverly is the company president responsible for administration, finance and marketing, while Tony is the VP, chef, and responsible for daily operation. "Mike’s knowledge of the business, his guidance on how to start, having us go through the numbers and helping us get ready to open were invaluable "